UAG is committed to promoting an inter-generational dialogue between 60s and 70s neo-avant-garde art and contemporary visual culture, curatorially keeping an eye on the modernist past while promoting the most innovative aesthetic and political debates of the post-modern present. UAG comprises three exhibition spaces showcasing thematic series. The Major Works of Art Series commissions original projects by working artists. The Emerging Artist Series features solo projects by younger artists informed by the Major Works series. The Critical Aesthetics Program commissions new work by renowned mid-career artists. UAG produces group exhibitions showcasing historical and contemporary art and film projects. Additionally, the Beall Center for Art + Technology offers hands-on installations of new media experimental art by internationally known artists. With two locations in Laguna Beach and Irvine Spectrum, the Village Gallery has introduced clients to the joys of collecting art for over 37 years. In addition to the cultivation of thousands of collectors, the company has launched the careers of such popular artists as; Fabio Napoleoni, Michael Godard, Fabian Perez, Robert Finale, Cao Yong, Sam Park, Steve Barton, Steven Quartly, Daniel Del Orfano, Andy Thomas, Frogman and many other fine artists. 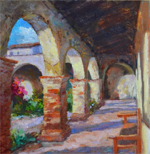 Featuring artist Cliff Wassmann's paintings and photographs of Dana Point, San Juan Capistrano, Laguna Beach & San Clemente.